Research Associate, Jeannie Holstein, comments on the Growth 100 programme so far. The first cohort of the Growth 100 programme, delivered by The University of Nottingham’s Haydn Green Institute for Innovation and Entrepreneurship and designed to give 100 Nottingham-based owners and directors the knowledge and skills to help them expand their businesses, has just graduated, and it seems an ideal time to reflect on progress so far. Growth 100 is one of many programmes in response to the broad government agenda to address the need for economic growth by developing small businesses. This is not a new policy, but probably what is new is the role of the Business School as an ‘anchor institution’ in this growth agenda. Business Schools have led programmes to support SME development in the past, to mixed reviews. The impact of these programmes has often been inconclusive, partly because of the lack of time available to owner-managers for reflection and innovation; and partly because of the lack of a deep and intimate understanding of the SME and their context within the course delivery. From my point of view as Research Associate on the programme, Growth 100 appears to be different. 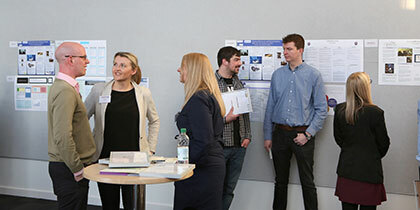 The programme itself appears to have allowed the participants to find the space to think strategically about their business, inside and outside the classroom. This seems an oxymoron given the demands placed upon them by the regular attendance and the homework tasks diligently undertaken, at first glance an extra burden to add to the many other pressing concerns of running a business. There is no doubting the commitment that has been required to make time for Growth 100 but the businesses have used their time well, particularly in the ‘classroom’, with the creation of a ‘strategic space’, that is then taken back into the firm. What does a strategic space look like? What does a strategic space look like? Well given the research so far, it has been described as an oasis of calm. It’s a place where the mind becomes clearer, the solutions to the problems you had, and the problems you didn’t know you had, become apparent. It is a place where in discussion with your business peers (and then your associates in the firm) you can build a way forward for your business and subject your thoughts and practices to constructive scrutiny. There are no axes to grind or snake oil to buy. You end up holding a mirror to your business and in the reflection you can see the way forward. You also choose which mirror you hold up. Practically you pick up the tools for the job in hand too, or at least the capability to assess where you might need to go for help. It’s not easy. It involves scrutiny and openness. It is a place of trust. It is early days in the research, but we are starting to develop an understanding of the boundary of strategizing to one that could include an educational intervention led by academics within a Business School. It opens up an understanding of strategizing that is less common, as a collaborative episodic practice that occurs both outside and potentially in the firm. This could have significant efficacy for strategic change in the firm, given its reflective and collaborative nature. So we will be watching this space!